Lori Locust will be an assistant defensive line coach with Tampa Bay this season. Christine Arians had had enough. Her husband, Tampa Bay Buccaneers coach Bruce Arians, the coach responsible for starting the trend of hiring female coaches in the NFL, was talking about giving another internship to a woman. "I said, 'Oh, babe. We don't need more internships.' Like, 'Oh, yeah, come on, little lady. Hang with us for a year, and then we're going to let you go,'" Christine said. "No, find somebody that's qualified to coach, and hire them." Guest lecturer, George Mason University. Doctor of Physical Therapy, New York Medical College. 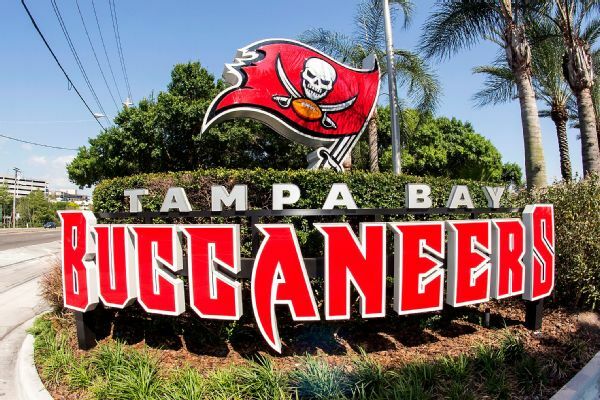 In early March, the Bucs became the first team in NFL history to hire two full-time female coaches in assistant defensive line coach Lori Locust and assistant strength and conditioning coach Maral Javadifar. That came less than four years after Arians made history by hiring the first female coach, Jen Welter, as a training camp intern in 2015. Since then, the NFL has slowly been opening its doors to more female coaches. In the four years since Welter broke the barrier, 10 NFL coaches have hired women as interns or full-time coaches. "It's our responsibility now to continue to find and develop that talent pool that's out there," Locust told ESPN. "I talked to a lot of people about this. The last thing we want to do collectively is be looked at as not credible or not earning this opportunity. And I think that's where the responsibility is right now." Last season, the NFL had 10 female coaches -- three full-time and seven interns. That was twice as many as in 2017 and 1,000 percent growth from four years ago, when Welter was the only woman coaching in the league. "We've made great progress," said Sam Rapoport, the NFL's director of football development. "I think that it's a drop in the bucket as it pertains to where we can potentially be in the future." After Welter was hired in 2015, just one team, the Buffalo Bills, hired a woman in 2016. But before former Bills coach Rex Ryan hired Kathryn Smith as a quality control coach, he called Arians. Ryan's primary concern? The media coverage, Arians said. "They handled it beautifully," Arians said. "No coach wants distractions, and no coach wants to be a distraction." Arians hopes the day is coming when a team can hire a female coach, and it won't be a headline. He isn't the only one. So does the NFL. So do the women in coaching. "The 10-year plan is to normalize women on the sideline in football," Rapoport said. "We're not focused on the first female this and that. We're not focused on the first female head coach or the first female GM. We're focused on normalizing it so we stop talking about it." Locust said attention has had one good side effect. It has helped women in football connect. She described her 13 years in coaching before the media began reporting on the growth of female coaches as a "very singular journey." 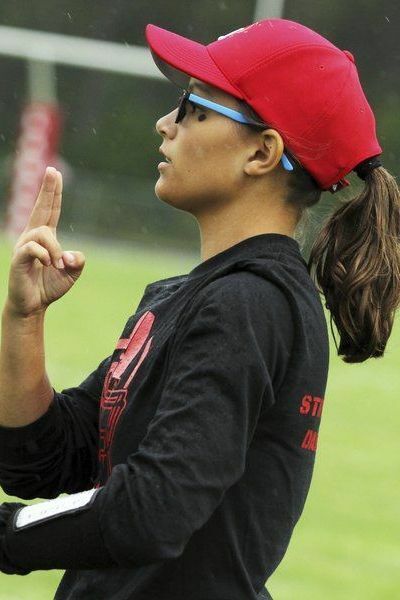 After Welter was hired, she met other women chasing the same dream with a love of football. There will be at least three full-time female coaches for the 2019 season, as Locust and Javadifar join San Francisco 49ers offensive assistant Katie Sowers, who has been on Kyle Shanahan's staff since 2017. Two full-time coaches last season -- Buffalo Bills assistant tight ends coach Phoebe Schechter and Oakland Raiders assistant strength and conditioning coach Kelsey Martinez -- are no longer with their respective teams. More interns, both summer and seasonal, will likely be finalized by June, Rapoport said. Welter says that when she was hired by Arians in 2015, she couldn't have imagined the ripple effect. Bottom line? It was hard to imagine women coaching in the NFL at all before she did it. "The most important thing is that we continue to see doors open and women progressing within this sport on all levels," Welter said. Rapoport has been working, largely behind the scenes, to present women interested in coaching, scouting, operations and strength and conditioning with the opportunity to get in front of head coaches. That has proven to be one of the primary hurdles for women trying to get to the NFL. The Women's Careers in Football Forum, now an annual staple at one league event every year, was Rapoport's brainchild. It started two years ago in Orlando, Florida, coinciding with the Pro Bowl. The NFL targeted women from around the world who played football, and 220 showed up. Last year, the league created an application process to "strongly vet" attendees. Of the 50 admitted, 29 landed jobs through the forum, in departments such as coaching, scouting, operations and strength and conditioning in the NFL, CFL, AAF, college football programs and high school football programs. The event was moved to the NFL combine in Indianapolis this year, and Panthers coach Ron Rivera, Ravens coach John Harbaugh, Bills coach Sean McDermott and Arians spoke in front of 42 women interested in finding a path to the league. The two-day event included a panel with general managers. The women got honest feedback about how to get their résumés on the desks of head coaches. They were also told about the day-to-day life as a low-level NFL assistant, which includes long hours and hard work. When it comes to hiring an assistant -- male or female -- Arians said head coaches look for two things: experience and the ability to help a team win. He said he feels a responsibility to drive diversity and inclusion, which is more than just coach speak. Welter is proof. 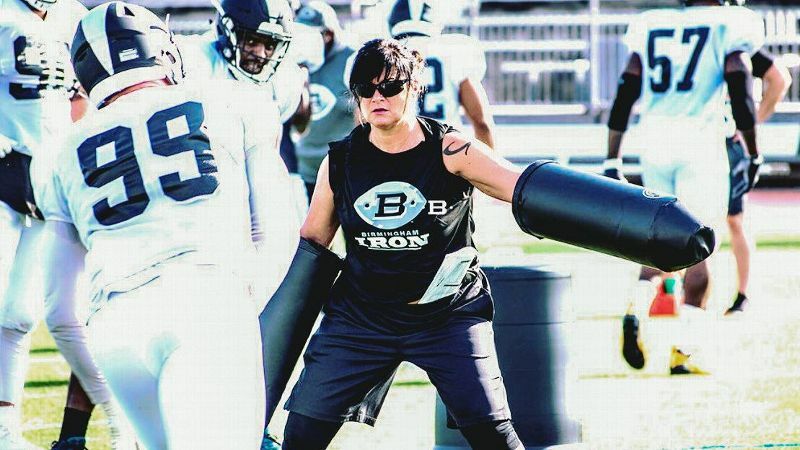 She coached for the Atlanta Legends of the AAF until the league recently folded, and she'd "love" to coach in the NFL again. As the first female coach, regardless of title, Welter, like Arians, knows she has to be a leader. "If you're the first, you have to realize it's not about you," she said. "It's about what was started and how progress can continue to be obtained. So that's what always drives me. How can we ... keep those conversations going because if you don't talk about it, it doesn't change." 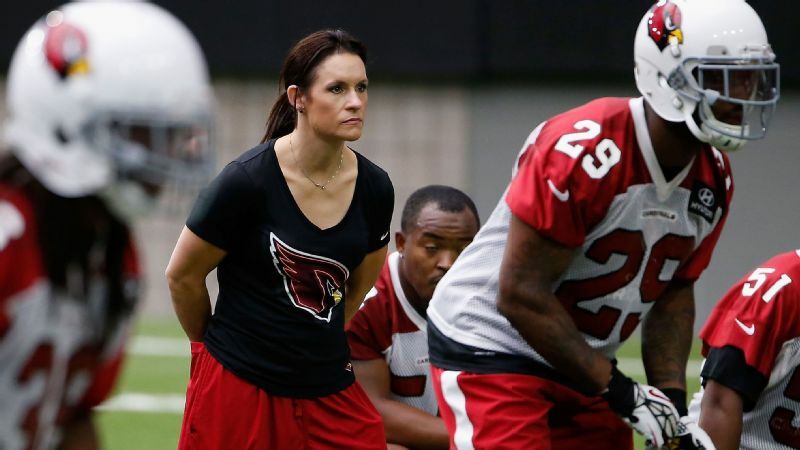 Jen Welter, who interned with the Arizona Cardinals, was the first female coach in the NFL. Many coaches have come to the realization that women represent a previously untapped candidate pool that could make their teams better. "We're basically taking half of the population in the world and saying, up until recently, 'OK, well, we're not really looking at you,'" McDermott said. "Well, why not? At the end the day, we're looking for smart people that can help us achieve the goal of winning a world championship, so why not open it up to everyone?" By doing that, teams are welcoming new and different points of view. General managers have told Rapoport that a diverse group of opinions has been beneficial. McDermott was watching the Oscars in February when a speech caught his attention. He adapted its message into football terms: Why not make the NFL representative of America? Especially in the coaching ranks. Sam Mullet is the the offensive coordinator at Bear Lake High School in Michigan. But how do women get there? There was a widespread feeling in Indianapolis that a pipeline for female coaches isn't just wanted -- it is necessary. The typical progression of a coaching career among men is to play football, then start coaching at the high school level, jump to college, then possibly do an internship, with the end goal of the NFL. But with one woman coaching in college and only a handful in high school, Locust said the need to develop more female coaches at lower levels of football is "extremely important." "Being able to develop a path or widen it at certain points is super important because you can be a great coach, but you have to be technical, and you have to know how to do things in a manner that's a higher level," Locust said. "A pipeline -- and done the right way and with the right candidates, who are in it for the right reasons -- I think that it's super important." As Welter put it, football isn't a "what you know" business. It's a "who you know" business. Schechter, who became the fifth full-time female coach in NFL history in 2018, one year after interning for the Bills, added: "It's the only way this will be successful over a long period of time." There was all the proof the NFL needed at the Women's Careers in Football Forum. There was Samantha Mullet, the offensive coordinator at Bear Lake High School in northwest Michigan. And Callie Brownson, the offensive quality control coach at Dartmouth, the first female coach in Division I football. She coached high school before landing a college job. Each represents what a developed pipeline to the NFL could look like. The now-defunct Alliance of American Football, which started play this spring but ceased operations last week, was one new way for women to get experience as full-time coaches. Arians termed it a perfect proving ground. 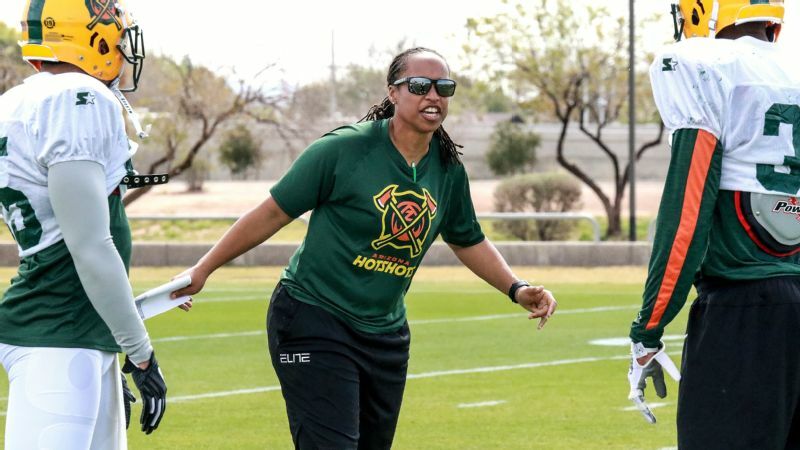 The AAF had three women working as coaches: Welter, Locust and assistant wide receivers coach Jennifer King of the Arizona Hotshots. Both Mullet and Brownson aspire to work in the NFL, but they know there are no guarantees. They are paying their dues, the way their male counterparts have for years, in hopes of getting an opportunity. "The more you can experience, the better off you're going to be," Brownson said. "What I'm learning at the college level right now will be totally applicable if I decide to go to the NFL at some point, and I think that's really what it's about."